Today in 2015, BT continues to reduce the number of telephone boxes and public payphones, but back in the late eighties, the story was very different. The following article which is taken from a feature that appeared within British Telecom Phonecard News Christmas 1988 edition recounts the expansion and modenisation of BT's public payphone network in Swindon, Wiltshire, England, where the Phonecard payphone played an important role. 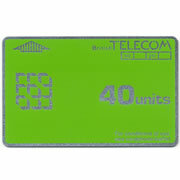 Phonecard News was circulated to selling agents of BT Phonecards. Phonecard agents in Swindon are preparing for a massive upsurge in sales as British Telecom install 88 new Phonecard payphones in the town in a move to improve service to customers and fight back vandals. Swindon is a young, lively town with a population nearly 170,000. Before modenisation of Swindon's payphone service got underway in May, the town was served by 138 payphones, only seven of these Phonecard operated. On completion of the programme in late October, Swindon's total number of payphones will have risen to 175 with Phonecard payphones making up a substantial 65% of the total. 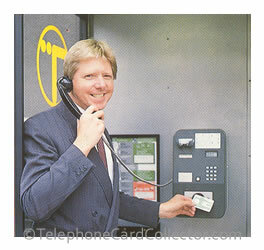 Pictured right - Maurice Press of British Telecom's payphone services trying out one of the newly installed Phonecard koisks in Regent Circus, Swindon. The town centre particularly is in the midst of a massive installation programme. Previously served by just eight boxes, the busy shopping areas will soon provide sites for twenty-eight payphones, nineteen of which will be Phonecard operated. And British Telecom are confident that all the new payphones will be well used and profitable. Profitable for British Telecom and profitable for Swindon's Phonecard agents. The unusually high percentage of Phonecard payphones has been agreed primarily to discourage theft-orientated vandals in an area that has been something of a "blackspot" for British Telecom. Research has shown that Phonecard payphones are five times less susceptible to vandalism than their coin-operated counterparts rendering them an attractive proposition in particularly vulnerable sites. Obviously, with such a sudden influx of Phonecard payphones, British Telecom felt it was imperative that the local people were kept abreast of the changes and were properly informed how to operate the new phones right from the start. With this in mind British Telecom undertook a comprehensive educational programme. Before the installation began a newsflash was published in a local paper to alert the public to the radical plans, 20,000 complimentary Phonecards were offered through a local newspaper feature, and a further 5,000 Phonecards were distributed to the community through the local borough council. Explanatory posters and display material were designed and produced, then strategically placed in health centres, libraries and community centres all over Swindon in an attempt to reach as many people as possible. And now with the modernisation programme almost complete, first indications of how Swindon has greeted the changes seem very positive indeed. The public have readily accepted the high proportion of Phonecard payphones because of their reliability and convenience. In turn agents are selling more Phonecards than ever. A view echoed by Mrs Jackson and Sheila Alexander who work in Adrian Heyward's newsagent, opposite Swindon's Town Hall: "We sell a lot every day, we're so close to the Phonecard payphones now that when customers want to make a call they just dash over the road and buy a Phonecard. 10-unit and 20-unit cards are our best sellers but we have had 100-unit cards in and sold the lot." Pictured above - Sheila Alexander selling a Phonecard to a customer at newsagent Adrian Heyward's shop in Regent Circus. Swindon is not alone in its Phonecard crusade. Other towns in British Telecom's Severnside District are undertaking similar programmes such as Bath, Western-super-Mare and Bristol. And it won't stop there! Across the country British Telecom will be installing more and more Phonecard payphones as other districts modernise their own payphone services. Soon agents all over the Britain are sure to see sales going up Swindon-style. 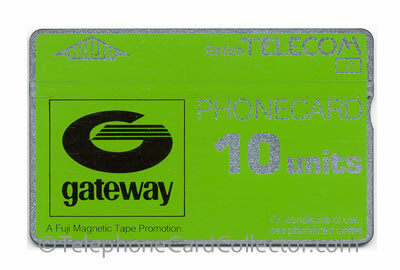 Pictured above - Issued in 1987 Gateway 10unit BT Phonecard. The article above first appeared within the Christmas issue of Phonecard News in 1988. 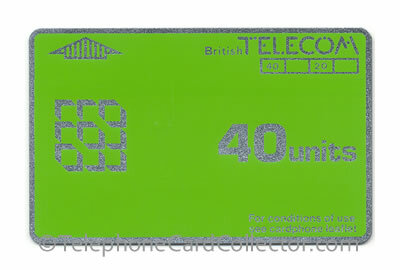 Were you a BT Phonecard reseller in the eighties, nineties or early noughties? 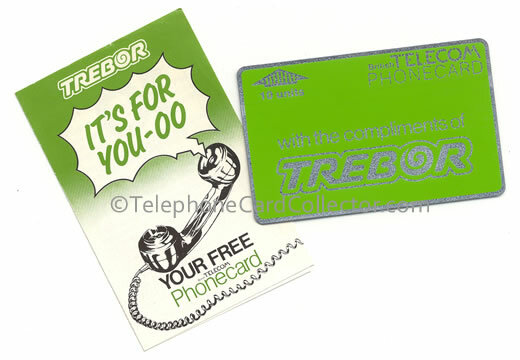 Do you have copies of British Telecom Phonecard News and/or other promotional material e.g. stickers, posters, etc, relating to BT Phonecards? If you do please contact me so I can feature similar articles on this website and add other interesting Phonecard related items to my growing and increasely diverse collection.